By Katy Klarnet, September 2015. As a retired librarian (and now occasional substitute at area public libraries) I was interested to learn that Sister Cities Essex Haiti had launched a library building project in Deschapelles, Haiti, and I offered to help. This led to me to spend several months off and on as a volunteer consultant, advising Terry Parkinson, Chair of the Library Committee and Jenifer Grant, Vice-President-Deschapelles Project Coordinator on some of the technical and procedural aspects of establishing and running a community library. As the building neared completion and the time to set up shop approached, I prepared to transition from “blue sky” consultant to hands-on participant. It was time to put boots on the ground by accompanying Jenny Grant on a four-day visit to Deschapelles. Here’s how it went. We arrive in Deschapelles at the end of a very long day that’s been filled with astonishing new sights and sensations. On arrival hours earlier at the airport in Port-au-Prince, Jenny pushes a luggage cart piled high with bags of library supplies and a few personal items through the unfamiliar customs procedures, surrounded by the crush of porters competing for our business, while I trail behind with the carryon bags. When we exit the building, the heat is stunning! A sun and summer lover, I can tolerate a lot of heat, but Haiti in September takes hot to a whole new level. It’s probably the hottest month here but throughout my visit I’m impressed by how seldom anyone, including visitors and expats, even mentions the heat. Maybe it’s because there are more important problems to deal with – problems that, unlike the weather, many Haitians and their allies are working to solve. 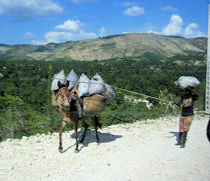 People in the Artibonite Valley where Deschapelles is located survive mainly as subsistence farmers. Fewer than half the children attend schools that lack almost any books or other materials, and they struggle daily without any of the basic resources we take for granted – access to clean water, electricity, sanitation or transportation. Fortunately, there are also some business owners and community leaders who are working to make life better for their community, and these are our partners. And in spite of the hardships of daily life, many of the people I see and all of those I meet seem full of hope and determination, not to mention good humor and goodwill. A foundational belief at HAS, the source and wellspring of so much hope and progress in the community, is a quote of Albert Schweitzer’s: “You cannot alleviate all the suffering in the world, but you can give hope to one single man.” The truth of this idea is evident in Deschapelles. Back to the airport. 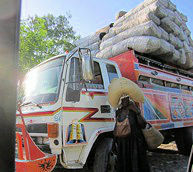 We stand in the heat, surrounded by assertive porters – intimidating but not frightening; they’re just trying so hard. It’s a fair introduction to the facts of life in this country. Jenny’s phone isn’t set up for local calls yet; she can’t reach Anny, our colleague and for today, our driver. 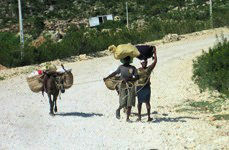 So one of the porters helpfully offers to make the call – his only agenda, to be helpful. Eventually we do find Anny, piling our bags and ourselves into her sturdy SUV. That sturdiness will be tested on the drive ahead, as we take a seldom travelled, rugged route through the region’s interior; an angry political protest has led to a roadblock on the “easier” route. The conditions on our drive – of the road, the land, but especially of the people who walk and walk, endlessly, over miles of dusty roads, loads of charcoal (the region’s primary cooking fuel source) on their heads or their donkeys’ backs, traveling to or from distant markets – these sights are new and amazing to me, though not to my veteran companions. They see all of this and elsewhere in our travels – the teetering, overloaded tap-taps, dilapidated shanties, chaotic markets, garbage filled alleys and malnourished children – but they also make sure to point out the frequently gorgeous views of distant mountains, winding streams and verdant valleys, smiling children and men and women who wave hello. At last, as dusk descends, we arrive in Deschapelles. 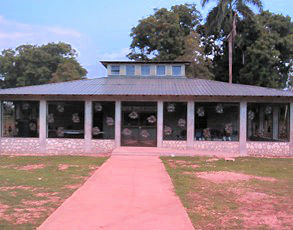 We park outside the library and I see the just-completed building for the first time – its stone and iron exterior walls rising in the middle of a bare, still-to-be-landscaped courtyard surrounded and secured by a solid wall, topped with an iron grate and connected to a solidly constructed guard house. It is a sight so beautiful, so improbable, so wonderful in this harsh, impoverished, struggling community that it might appear is if deposited by aliens, but in fact it exists through the determined efforts of two communities – one in Connecticut and one here in Deschapelles. The building would not be out of place in a much richer environment, as the space is beautifully designed to be protected from the elements but open to the outside, topped by a skylight filled, atrium-like roof, with large, grated windows that let in a maximum of natural light. Seeing all of this in the original design, in blueprints and renderings, really hasn’t prepared me for the real thing. Because there is nothing like this here. It really is a kind of miracle. Tomorrow, I will see the inside and we will get to work. But now, the light is failing and the bugs are biting. It’s time to go “home” to Kay Choucoun, the modest bungalow that Jenny Grant and Sister Cities volunteers use as a crash pad when they visit Deschapelles, and which serves at other times as an offsite library office and local SCEH headquarters. Friday and Saturday, Sept. 4 and 5. When we get to the library around 8AM, a small group is waiting: security guard, some curious local adults – and children (future volunteers and patrons) and, at last, the 5 important library employees I’ve been hearing about for months: Besley, Odverne, Wednise, Pleurette & Elicianne! I am excited to meet them and nervous – mostly about how we will communicate. My French will not be adequate, my Kreyol is non-existent. How many times has Jenny had to reassure me that yes, there will be someone to help translate — a lovely, eager helper named Louines Domingue (Linus in English). Introductions are made and I have my first experience with the warmth of a typical Haitian greeting: a handshake and a kiss on the cheek from everyone. Most Haitians, I come to understand, routinely offer this kind of personal, affectionate greeting even to strangers. Whatever else our language barrier and cultural differences may prevent me from coming to know about these people in four short days, the easy warmth, ready humor, resourcefulness and optimism of the people involved in the library and the Deschapelles community is evident. Inside the building, we survey the scene: fully finished library space, walls, floors, shutters, fixtures – bright light streaming in. Work tables are scattered randomly in one section of the front study area, dozens of colorful adult chairs are stacked here and there, beautifully decorated children’s chairs and tables are stored in the gatehouse, where just completed bookshelves are also waiting. To the small collections of clerical and library supplies delivered earlier, we add more practical items – notebooks, file folders, index cards, pens, rulers, scissors, a portable typewriter etc. that made the trip with us. But the overwhelming task before us, before me and the four library staffers politely waiting for instructions (Besley is occupied with computer software issues): boxes and boxes of books. Used, new, donated, purchased – a seemingly disorganized collection that has slowly accumulated while the building neared completion. And so we begin: to unpack the books, clean the furniture, organize the books, move the furniture and reorganize the books. I am confused, inefficient, and the challenge of communicating in my faulty French with Kreyol speakers, even with some translating assistance, combined with the stupendous heat (which seems to bother no one but me) makes the process feel at times as if we are all moving in slow motion. But soon, somehow, work gets underway, tasks get identified, a process takes shape. Turns out about half the books have already been examined and assigned a Dewey number – a few of the staff have been working on this for weeks; my little manual delivered months earlier and the big fat FOKAL guide have been of real use, careful thought and hard work has been invested in advance so that we can make the best use of this time, of everyone’s energy and effort and of my modest expertise which at last, I can provide in person. With my encouragement, Pleurette and Elicianne set to work creating Dewey labels for the spines of the books. Wednise and Odverne and I – with help from Anny – attempt to assign more Dewey numbers to the many books as yet un-classified, a difficult job that I soon realize Wednise is particularly skilled at. What I don’t know about these colleagues – and just about everything and everyone in Deschapelles – is a lot! While this work proceeds in the adult area, Jenny is arranging furniture and beginning to sort the children’s books into reading and read-to levels. About the books – the adult books are a mixed collection, mostly in French, many donated, but others new and spiffy. By design at this point, the collection is thin, for the goal is to start with a framework for the future, to which new books will be added as the needs and interests of the community become clearer and the gaps in the collection become obvious. Still there is a healthy diversity – of literature, history, a beautiful new set of instructional workbooks for teachers and students, art books, and French language instruction. There is a good assortment of novels, stories and poetry. We see there may be a need for more science and art and some light reading titles — just the kind of thing we need to know. We also know there are plans in the works for tablets with large digital book collections. 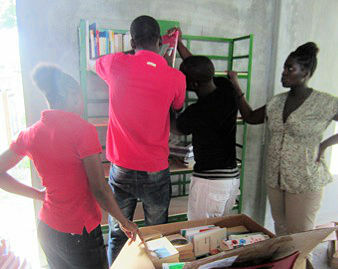 The children’s books that Jenny is sorting are mostly brand new and colorful – many in Kreyol, picture books and storybooks, for the youngest non-reader to the most advanced teenager. Wonderful! And from the moment we arrived this morning, a small troop of very curious future patrons has been happily trying out their new library. Five or six little ones – from about 4 years old up to 7 or 8 are busily moving the children’s chairs around, exploring the learning game collection (another great discovery among the boxes) and e ventually settling down with Jenny – who could not be deterred from this task for any reason – for a story time and chat. 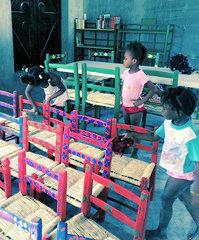 That these children so clearly have little else to do and nowhere else to go, that they are so enchanted (and enchanting) to be here for as long as we’ll let them, that they relish the chance to clean the chairs or help mop the floor with energy and practiced skill – this is just more evidence of how valuable the library will be here. I glance up from my sorting and labeling, unpacking and arranging; there is Jenny, surrounded by children, all turning pages in their shiny new books, an older boy in fact is reading to his enthralled audience. Elsewhere Anny is scrubbing furniture; she and Besley are unpacking computers and arranging furniture. So pass Friday and Saturday mornings. On both days, we begin to wrap up around midday, the whole group of 7 or 8 – staff, volunteer, translator Linus, Anny, Jenny and me returning to Kay Choucoun for lunch. There’s a strategy behind this thoughtful and welcoming gesture of Jenny’s – lunch for all each workday, a modest salad or rice and beans and some fruit or cookies. The talk is of the work so far, the tasks ahead and the larger questions of library policies, rules and procedures, motto and mission statement. 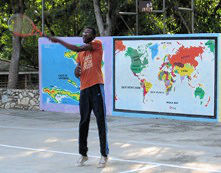 Importantly, I am learning, this is the Haitian way (and also very French it seems to me). Everyone’s opinion is solicited, everything discussed, reviewed, debated and discussed some more; in the end, everyone has ownership and is committed to the final decision. It’s an approach that requires some patience, much cultural sensitivity and a lot of Kreyol; thank heavens for our essential liaison and cultural advisor, Anny Frederique! After lunch, there are a series of visits and meetings lined up. In advance of our arrival, Besley has apparently scheduled almost every minute of Jenny’s day. 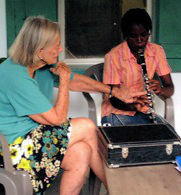 No time is wasted; every Sister Cities program gets attention. 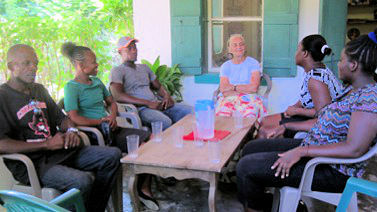 Music students, tennis players, Conseil members, itinerant artists, mural painters, furniture makers, a solar energy representative, local business leader Luquece Belizaire, and other community members arrive in succession each day for meetings, coaching, progress reports, assignments. We visit band rehearsal, tennis practice, hospital rounds and an English class. We attend a meeting of ODES (our SCEH counterpart in Deschapelle), where great appreciation for the library is expressed, as well as some impatience for it’s opening; perhaps a good problem to have now that that day is drawing closer. Jenny offers a brief update on progress and plans, and even I am asked to comment, which I manage to do in my fractured French. We spend our last morning in the library putting tables and chairs in their proper places and setting up computers. 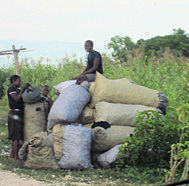 Supplies are sorted out and work to be continued after we leave is organized and discussed. Finally, it’s time to start putting books on the just finished shelves – in their proper order. And this is when I make an interesting discovery and experience the most satisfying moment of my work time in Deschapelles. For although it was apparent that Odverne, Wednise and Pleurette had been carefully noting the appropriate Dewey numbers for many of the books and labeling them accordingly, I now see that they haven’t fully understood how the numbering system will determine their precise location on the shelves – a question that baffles many well-educated Americans with years of experience as library patrons. I soon find myself surrounded by the whole crew, demonstrating in French how the sequence of numbers and letters determines the order of the books as they listen intently, confer with each other, and start moving the books into place, one by one. Each book – its subject matter and number – is discussed by the group and a decision is reached. The process takes longer this way but it is a beautiful thing. There is learning going on and soon the whole group will know a little bit about every book in the library. There is one last milestone to experience before this day ends. Luquece has offered to connect a generator temporarily to the library’s electrical system so that we can return after dark this evening and see what happens when the lights are turned on. It’s not the actual generator that the library will need nor the completed setup that will have to be installed, but a way to test the system and demonstrate the impact that lights will have in the library after dark – what it will be like for the children of Deschapelles to have a place to study, for the adults to have a place to read and write, and for the community to gather. 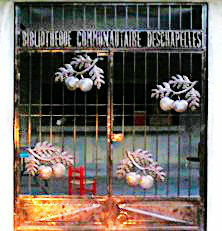 It will be, as the library’s mission says, a place “to enrich the lives of all, regardless of age or education.” Let there be light at the Bibliothèque Communautaire de Deschapelles.